This is a rethinking of the recipe I published last year. This year I made two slight variations. 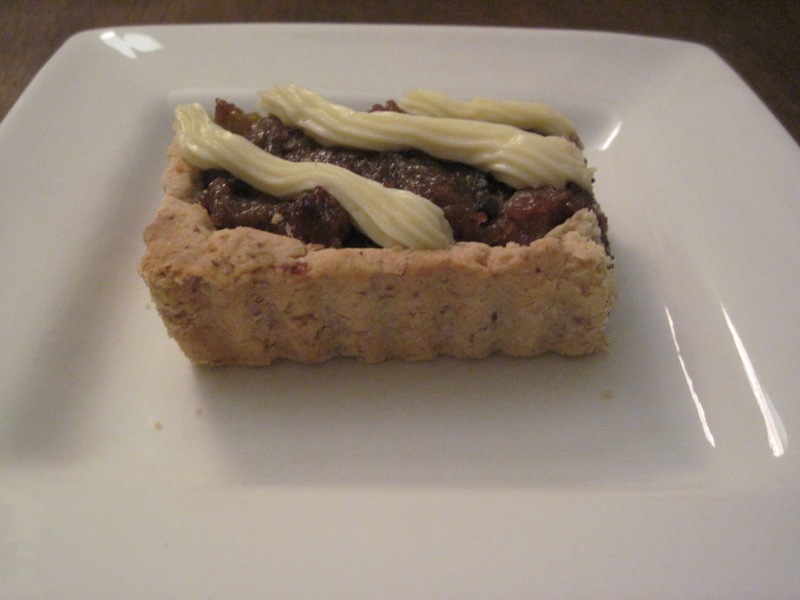 The first was I used a walnut shortbread crust which I rolled out thick and pre-baked before filling with the Pear Mincemeat. The second revision was a lemon cream cheese icing, which I piped on in a funky spiral, which struck me as funny because the tart was square. If you make tarts I think a rosette of icing in the center of each tart would be pretty. 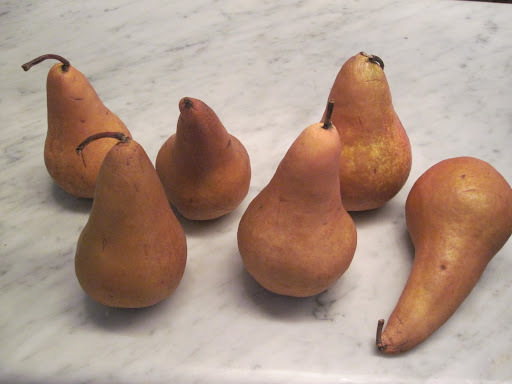 Peel, core and slice 3 pears a generous pound (I used Bosc, but any kind will work). Toss them with 1 T of lemon juice. Place in a food processor, add 1/2 small seedless navel orange (skin and flesh), 2 Tablespoons of Buddha’s Hand (optional) and the lemon tossed pear slices. Process until it resembles coarse shards. Remove from the food processor and place in a large heavy bottomed pot. 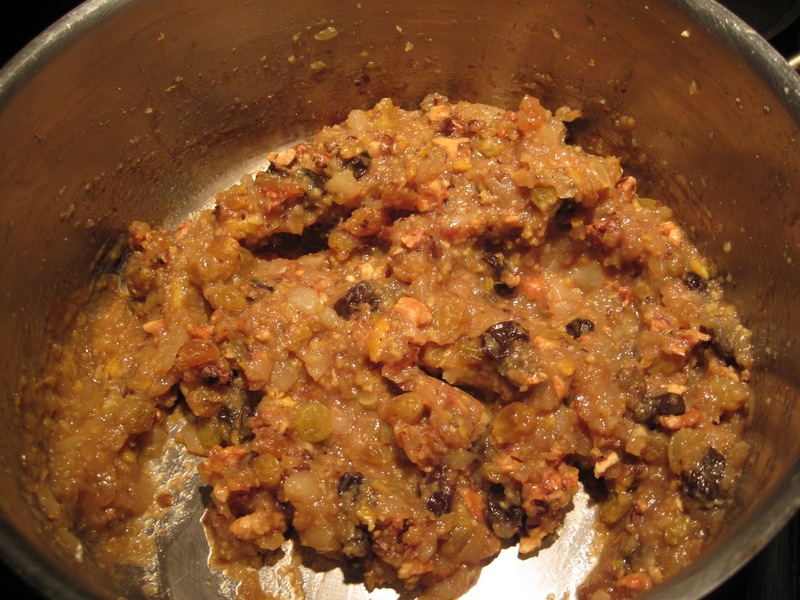 Add: 1/4 cup green raisins, 1/4 cup of currants, 1/3 cup of brown sugar, 1 Tablespoon of roughly chopped crystallized ginger, 1/2 teaspoon of cinnamon, 1/4 teaspoon of allspice, 1/4 teaspoon of freshly grated nutmeg, a pinch of salt and 1 cup of water. Bring to a boil then reduce the heat and simmer for about an hour or until it thickens, stirring occasionally. Remove from heat and fold in: 1/2 cup of lightly toasted and roughly chopped Walnuts. In the bowl of a food processor add: 2/3 cup toasted Walnuts and 1/4 cup Sugar. Process until the nuts are finely ground then add: 1 large Egg, 1 large Egg Yolk, 1 teaspoon of salt, 1 teaspoon of Brandy (or vanilla) 1 cup of room temperature unsalted Butter. Pulse several times until this mixture just comes together. Then add: 2 1/2 cups of All Purpose Flour and 1/4 Whole Wheat Flour. Pulse again until the dough just comes together. Don’t over process. 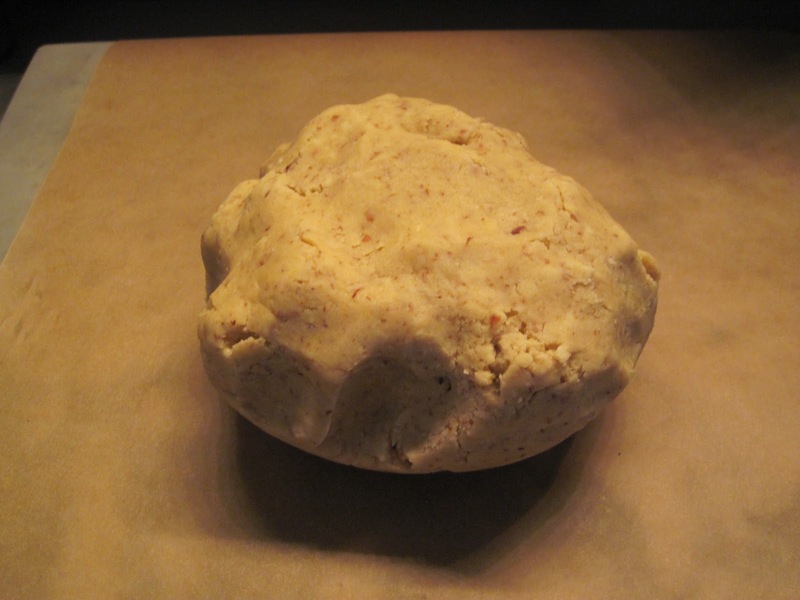 Remove the dough from the food processor and form into a ball. Place on a piece of parchment paper and then place another piece of parchment paper on top and press down on the dough to form a thick disc. Place in the fridge for at least an hour or overnight. Remove the dough from the fridge and let it sit for about 15 minutes at room temperature. Roll out the door between the two pieces of paper. Or if you want you can use your hands and just press the dough into your tart pan. You can use any shape; there is enough dough here to make a 10 1/2 – 11″ tart, or 48- ish tartlets. Gently take a fork and make fork prints over the bottom of the shell. Put in the freezer for 15 minutes. Take the shell from the freezer, place on a cookie sheet and put it into a preheated 350 F oven and bake 15-20 minutes. You don’t want it to be completely cooked, but the sides should show some signs of light browning. Let cool before adding the Pear Mincemeat. Put back in the oven and cook for another 25 minutes. Remove and let cool to room temperature before icing. This is a little off the cuff as I just made it up as I went along last night so feel free to make adjustment as you see fit. In the bowl of a standing mixer with the paddle attachment add: 8 ounces of Cream Cheese, the juice and grated rind of one organic Lemon, about 1/2 -3/4 cup organic Confectioner Sugar and a pinch of Salt. Beat until light and fluffy. I used a piping bag but you could just as easily spread it on thickly with a spatula. Be creative. A piping bag will make it easier if you are making a lot of tartlets. 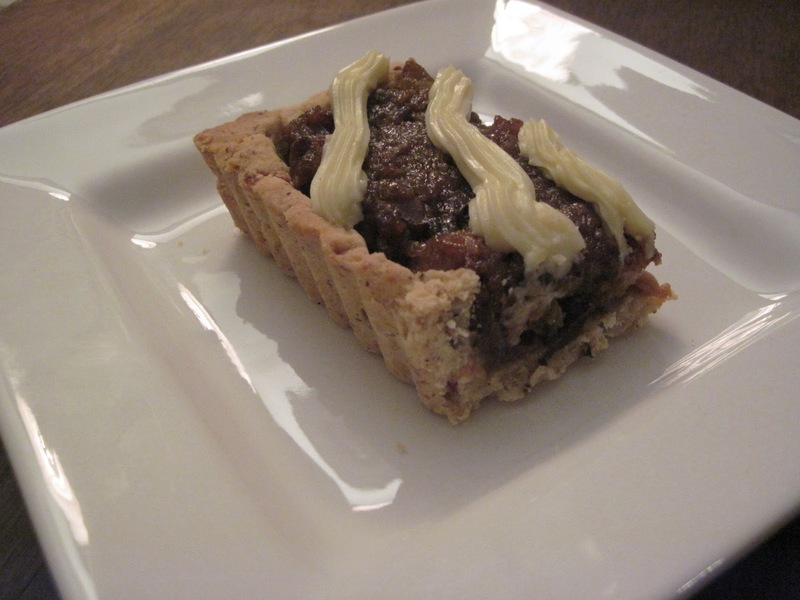 This entry was posted in Recipes and tagged Lemon Cream Cheese Icing, Pear Mincemeat, pears, recipe, walnut pastry dough. Bookmark the permalink.